These are but a few of the examples that show us we can [and should] be hearing from God. And as always, Jesus is our example. He says in John 5:30, I can do nothing on my own. As I hear, I judge, and my judgment is just, because I seek not my own will but the will of Him who sent me. Jesus is making it clear to us that hearing from God is a vital component to living a life that pleases the Father and satisfies ourselves. But how do we do that? And how can we trust that what we are hearing is actually God's voice and not our own, or even the devil's? I believe that God is always talking to us, but our lives are so busy and hectic that it is difficult to hear Him. 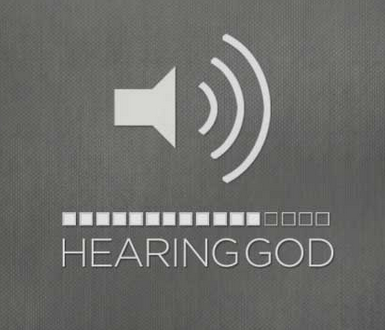 We have so many distracting "noises" in our everyday life that they drown out the sound of His voice. I contend that it is important to quiet ourselves in the presence of the Lord. However that looks like to you, it is necessary if you are going to hear Him. Whether it is closeting yourself in your prayer room, or by going to the garden of your heart, or making an appointment with Him in the dark hours of the early morning, you must find a way to meet with God in order to hear what He has to say to you. And I believe that the more you do this, the easier it will be to hear [and recognize] His voice in the midst of your daily noise. And I will tell you that I am jealous of those who hear the audible voice of God. There is no mistaking it for your own voice, and of course, there is no doubt as to His will or direction in that moment. I will tell you, that for me, His voice often comes as spontaneous thoughts; or as an idea, a word of knowledge, or a feeling. In other words, if I am in a quiet place, meeting with God about a specific situation, I will suddenly have a spontaneous (unrehearsed, unforced) thought that will give me an answer or a direction. It won't be something that I have analyzed and dissected beforehand, but will be clear and precise and will sound like my own thoughts, but not analytical or well-organized from prior examination. These thoughts will sound like me, but actually be wiser, more loving, more healing and more intentional than my mind's thoughts, which can randomly wander. I instinctively know where they come from; that it is Jesus flowing through my heart and combining with my mind to present His and the Father's will. And more often than not, this sudden spontaneous thought will illicit a reaction in my soul-- a sense of excitement at recognizing His voice; a heartfelt conviction that I am hearing His truth; and a sense of awe or peace. And the more I have trained myself to get in that quiet place, the easier it has become to hear Him. As I mentioned before, I have learned that if my thoughts run towards the analytical or overly organized and structured, then they are most likely my own thoughts, and I need to re-quiet myself and re-focus on Jesus. And if my thoughts tend towards the negative and line up with the characteristic names of the devil -- such as Liar, Accuser, Thief, or Adversary -- then they are thoughts that have crept in from demonic influence. If I am hearing God correctly, my thoughts will be positive and spontaneous; corresponding to the characteristic names of the Holy Spirit as my Counselor, my Comforter, and the Spirit of Truth and Wisdom. But the key to effectively hearing from God is to focus on Jesus's heart -- to get my heart in alignment with His. And how do I best do that? By fixing my spiritual eyes on His heart. Whatever I am focusing on will effect the accuracy of what I am hearing from God. Let me give you an example: If I am praying about a financial need and asking God for direction or a word of encouragement, and the eyes of my heart are fixated on that need, or the hardship I am suffering, or the fear that accompanies the consequences of that need not being met, then what I hear from God will not be His pure Truth, but will be muddied by my vision of that need. His response will most likely be unclear or confusing, and I will remain in a state of anxiety, while trying to convince myself everything will be OK. But if I fix the eyes of my heart solely on Jesus and His heart, present my need, and remain focused on Him, I will hear Him loud and clear -- a spontaneous reminder of Jeremiah 29:11 will come to my mind: For I know the plans I have for you, declares the Lord, plans to prosper you and not harm you, plans to give you hope and a future. I instantly know that came from Him; that I was not trying to remember Scripture or searching my mind for an appropriate verse that I could attribute to Him. Let me give you another example. If I am praying for someone's headache to go away and the eyes of my heart are fixated on the headache and what I am doing, and not focused on Jesus, then I am, in effect, making that headache an idol -- I am fixated on it, instead of Jesus. What I should be doing is the following: watching and seeing what Jesus is doing in that moment. Is He laying His hands on the person's head? Is He rebuking the spirit behind the headache? Is He asking the person to repent of bitterness or anger? What is He doing and saying? So, if you are not hearing from God when you are praying to Him, then might I suggest that you examine the way you are praying and where the eyes of your heart are focused? If I am suffering through a season where I do not hear His voice, then I know it's time to evaluate. When I am praying about a specific situation, am I focusing on the person who is frustrating me, instead of on Jesus? Am I looking at my sin, instead of the One who takes away my sin? Am I centering in on those who have hurt me, rather than He who heals my wounds? If the answer is yes, to any of these questions, then I must repent for having the eyes of my heart fixed on what I'm praying about, rather than the One I'm coming to in prayer. I'm afraid our ministry is small and we are centered around Texas, but thank you for finding worth in the words I write. May our Lord bless you! Your writings are profound...gave me peace in my heart as I'm trying to seek the Lord & follow Him whole heartedly after my life became a mess. Tara, I have found that all of our lives have a little messiness in them -- some just have more mess. So, I am no different than you. I'm just a follower of Jesus trying to become more like Him in a world where the devil is roaming around, looking for someone to devour. I am just sharing my journey towards wholeness, and am always willing to encourage a fellow Sister or Brother to stay focused on Jesus. You can click on the "email me" link at the top right if you'd like a more private conversation. I will pray for you!